The Maxton hydraulic Quick Disconnect Coupling is compatible with ISO B 7241 Fittings and can also be installed in the "B" Port for compliance with code ASME A17.1-2000 3.19.4.5. Volume discount may apply. 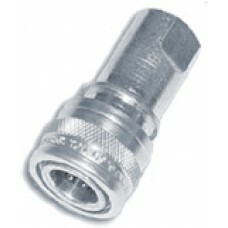 Provides for fast and easy gauge installation when measuring working pressure and setting the relief valve.